Shucks, This Place is Good! When parking is so limited you have to fight for your seat from the street, you know you’re in for a great meal. 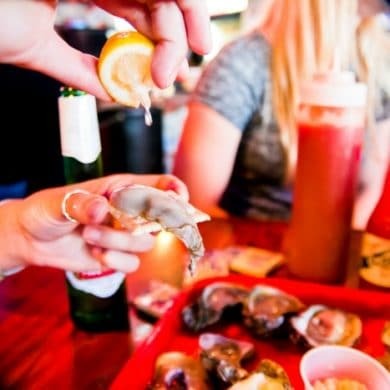 Dusty’s Oyster Bar in Panama City Beach is a favorite among locals. The small, hole-in-the-wall joint is decked out in dollar bills left from patrons from all over the world. Flat screen TVs line the walls, arcade games are tucked in random corners and the entire place is covered in vintage memorabilia. The pair comes here almost every day around 4:30. The restaurant saves their table for 15 minutes before giving it up to clamoring crowds. Like Wally and Dottie have found, Dusty’s has a fun, laid-back vibe with an unspoken invitation to let loose and leave your worries at the door. However, they only serve wine and beer, so you can still keep your wits about you. There are two bars, mostly occupied by locals. We recommend you claim a spot as a benchwarmer at the oyster bar, where the boys will keep your drinks full. Outside on the deck, funky seating surrounds a lake of lily pads, playful turtles and fish. Kids and adults alike enjoy the view’s entertainment. You can even get food to feed the fish. Jim, the infamous oyster shucker, claims, “Fried is out of my vocabulary.” He goes on to mention you must order by the pound … and always go blackened. We take his words very seriously. Our group started off with a dozen raw oysters and a dozen jalapeño parmesan cheese oysters. Upon first taste, there was no time for conversation. This is everything you crave from a Gulf Coast experience. Needless to say, those s(h)uckers were gone in 60 seconds. Next, we tried the smoked tuna dip, and Jim was right … it was smokin’. Prepared with fresh tuna smoked outside on the grill, the thick dip was complemented by black olives, tomatoes and jalapeños. Don’t shy away from the hot peppers. This is a “lick the plate” kind of appetizer. Our final pleasure of the night was the grouper dinner. Our server Jameson steered us in the right direction when he suggested to swap out fries for onion rings and coleslaw for cheese grits. The blackened grouper was flaky, and the spice blend lent the perfect fragrance. Now, the onion rings. Oh, baby. They were lightly battered and perfectly crispy. Dusty’s hush puppies were nothing to hush about. Our only complaint was that they didn’t come by the pound. Save room for the Marshmallow Bomb, a dessert treat of chocolate mousse and marshmallow cream inside a dark chocolate shell on a cloud of whip cream. We regretted to leave because the place was just getting poppin’ as we exited the building. However, their awesome meals and friendly service will definitely keep us coming back for more. Dusty’s Oyster Bar is located at 16450 Front Beach Road in Panama City Beach FL. For more information, please call (850) 233-0035.